With regard to valuing companies, the 10-year real interest rate plays a key role. It is foundation on which discounts rates are built and the higher those discounts rates, the lower the value of a company’s stock, everything else held constant. Ever since the financial crisis, the 10-year real rate has been close to historical lows. 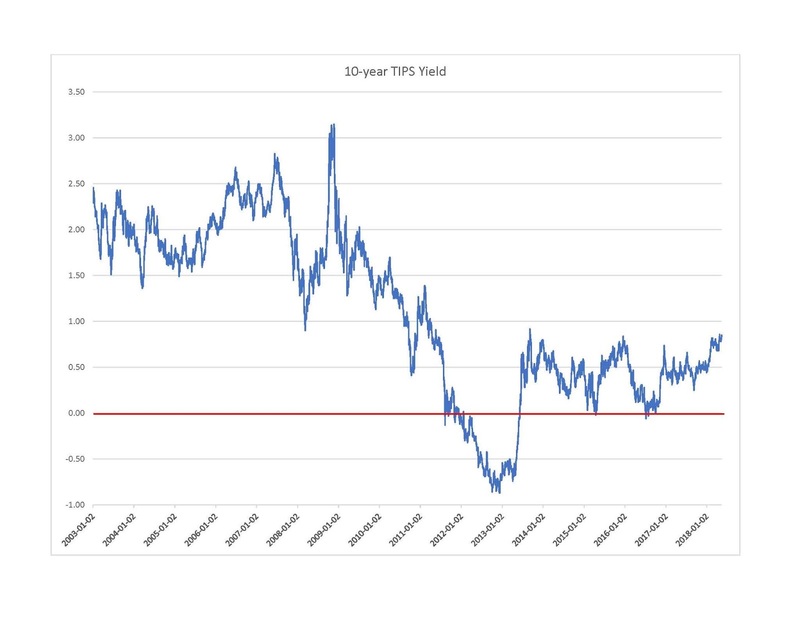 Unlike many real rates, the 10-year real rate can be observed directly because the Treasury issues 10-year Treasury Inflation Protected Securities, commonly referred to as TIPS. The graph below shows that prior to the crisis the TIPS yield moved randomly around a yield of about 2.0%. Then, during the crisis, it plunged and continued down until it reached negative territory in 2012 and 2013. Needless to say, everything else held the same, this was good news for stocks. And the news has remained good to this day. The TIPS yield has remained below 1%. But it is rising. With the economy strong, there is every reason to believe that the TIPS yield will return to more typical historical levels of around 2%. If that happens, the implications for stock prices are clearly bearish. A higher TIPS yield also means higher rates on Treasury securities acrosss the board. That is a big issue for government borrowing. Even with record low rates, the Treasury is running big deficits. With higher rates it is, “Katie, bar the door.” Investsors should be cautios.